Last October, Andy and I found ourselves in need of Halloween costumes on two separate nights. 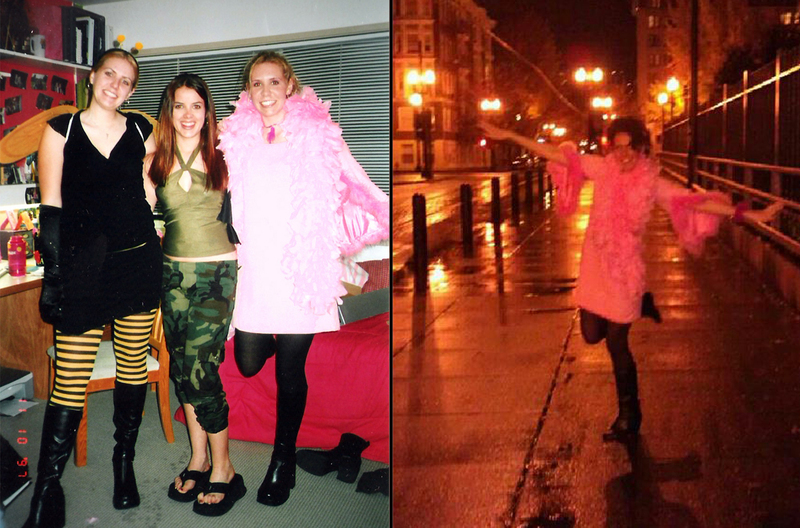 Since my main costume for the year was a little less cool without my friend Courtney as my counterpart, on the second night of celebration I pulled out an oldie but a goodie from the costume archives: the pink flamingo. A flamingo is a pretty great costume because it comes with its own pose: stand on one leg and flap your arms. (And we all know I need a prop or a gimmick to take a decent photo.) So I donned pretty much the same attire, paired it with some crazy hair and voilà! Flamingo redux. While I may not have gotten a lot of new creativity points, there was something easy about cloaking myself in flamingo garb once again – it didn’t take a lot of prep time and I knew it would be a hit. It may sound like a stretch, but the same can be said of hitting up a travel destination for a second time – it doesn’t take much prep time and you know the places that will be a hit. Last week I finally updated the “About Me” section of my blog and summed up my travels with the following: I haven’t been everywhere, but where I’ve been I’ve loved and I can’t wait to either go back or go further. I don’t know abut most travelers, but I’ve returned to quite a few places for a second (or third) time. Some of this is due to things out of my hands (it’s no surprise that when my mom and my sister lived in Central America I found myself in the same cities more than once – I’m honestly not exactly sure how many times I’ve been to Granada, Nicaragua) but other times it’s been mostly my decision to go somewhere again. Why I’ve hit up the same place on separate occasions mostly boils down to the fact that ‘show and tell’ has the same appeal today that it did back in grade school. In short, it’s only natural to want to share something cool with someone else. 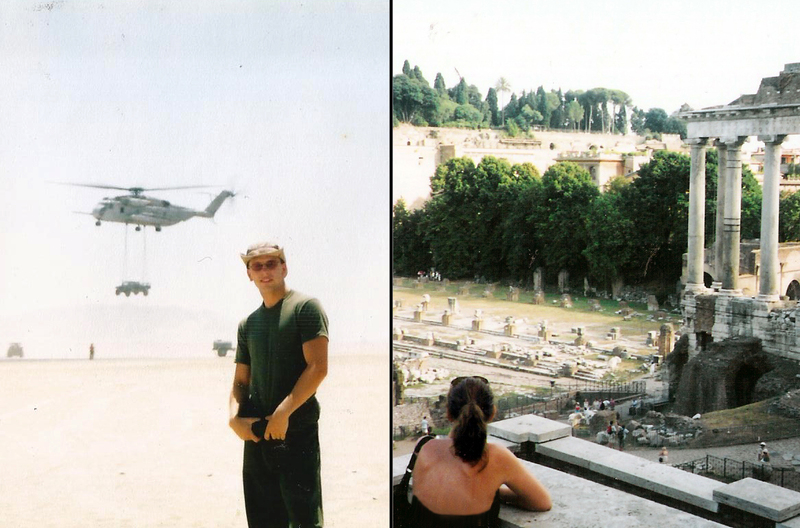 When Andy and I rekindled our high school sweetheart-ship as adults, the extent of his traveling was two tours overseas to war-zones in the Middle East. Needless to say, I was pretty excited to take him somewhere a bit more fun. First we honeymooned in Belize. New to him, second time for me. 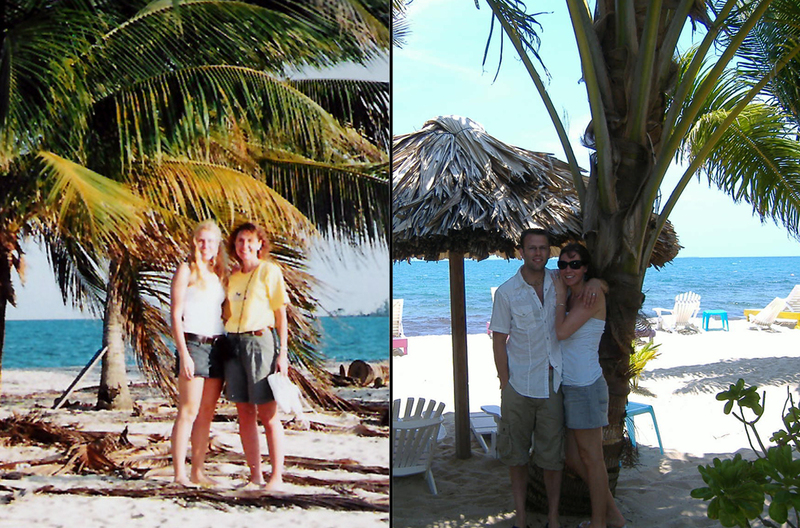 Placencia, Belize 2002 vs. 2008. Then we went to Guatemala. New to him, third time for me. 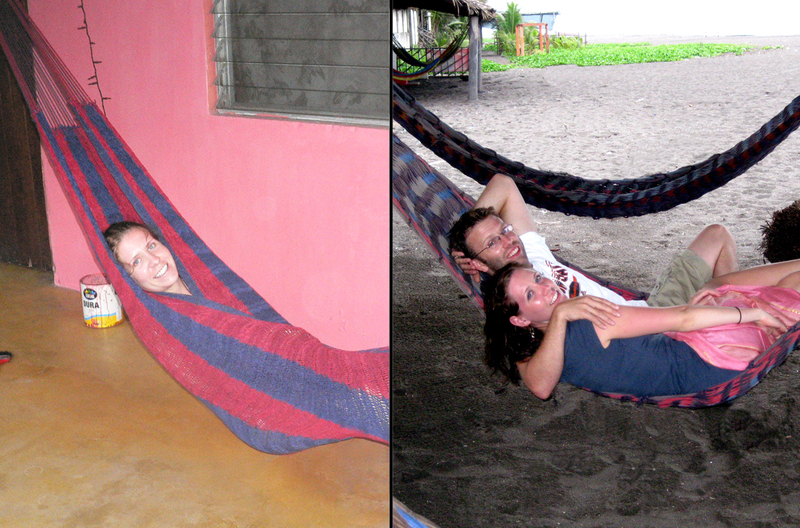 Monterico, Guatemala 2005 vs. 2009. 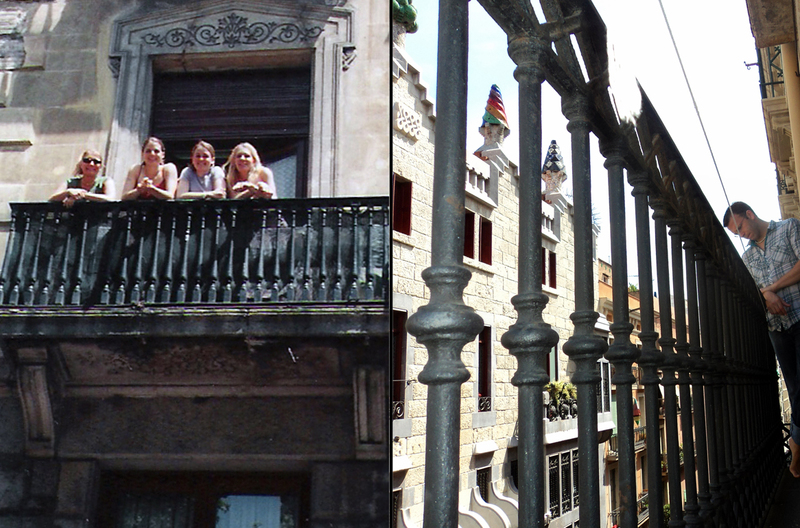 Then we went to Spain and Portugal. Both were new to him, Portugal was new to me and it was my third time to Spain. After that, we hit a few places that were new for both of us and overall, it seemed unlikely that Andy would get to play show and tell with me anytime soon because, well… I’m not about to book a ticket to Baghdad. But then he started traveling for work, and that’s when the tables turned. 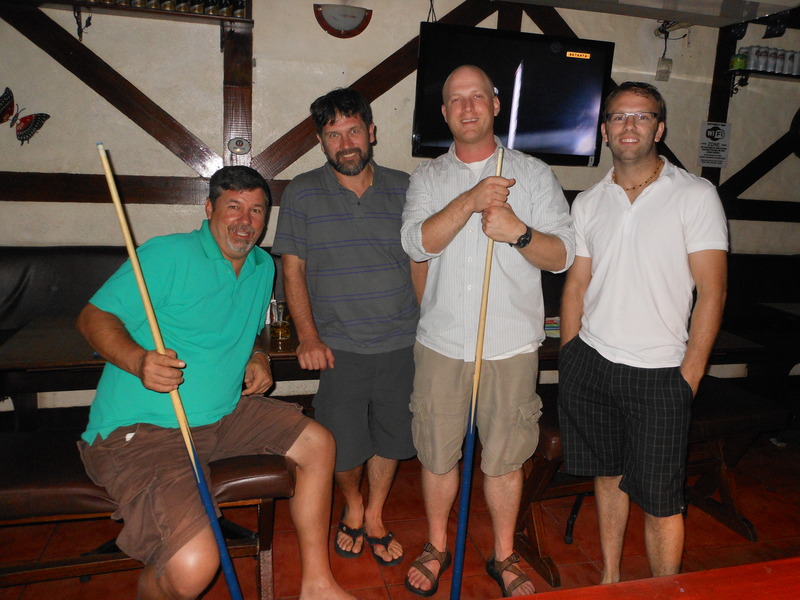 Andy and the guys playing pool in Manila, Philippines. About a week or so later, on our way back through Manila, we stayed at the hotel he’d called home for nearly a month. As the hotel employees showed us to the exact same room, (they were downright giddy and ridiculously excited about this same room thing) he agreed, in the business of traveling, occasionally going somewhere you’ve been before can be oddly refreshing. Although nowhere I’ve been again has ever bored me or made me think “been there, done that,” should you find yourself headed down a road already taken, I think the two key things to remember are to find something new and find something old. For me, when I landed in Munich last November, it was the charming third time but it couldn’t have felt more different. For starters, I was exploring Bavaria in the snow instead of the sun. I watched people river surfing in Englischer Garten’s Eisbach River (brr! ), I braved the ice and the cold while hiking around Olympiapark and I shopped for holiday sweets and sampled Glühwein at the Marienplatz Christkindl Markt, an outdoor holiday bazaar that dates back to 1642. None of which I did the first time. 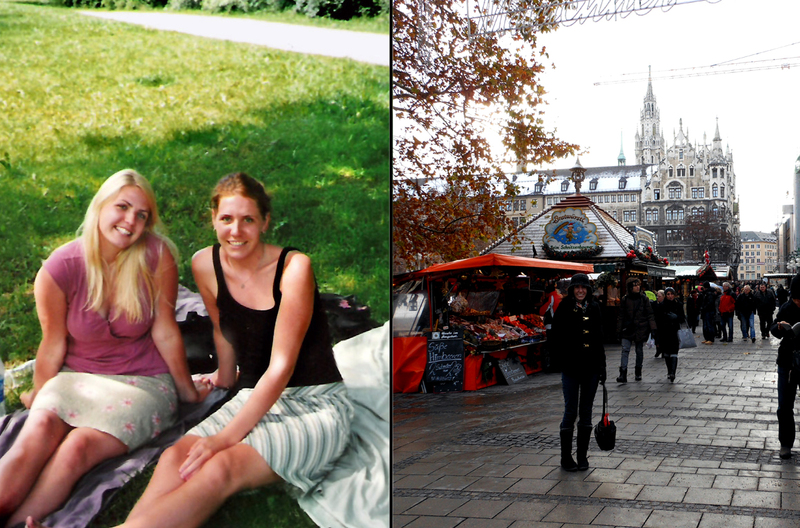 Munich, Germany 2004 vs. 2012. As far as finding something old goes, they say you can’t go back – but I say that’s wrong. If you’ve been somewhere before, then left, and then the world kept spinning and you return years later, chances are some things have changed but I bet some things are exactly as you remember. Exploring uncharted territory is fantastic but when you’re on the other side of the world, nothing beats a little nostalgia now and then. So just like my Halloween dress-up do-over can be a hit a second time around, the same goes for travel repeats. Of course, new places are always beckoning, but the world changes by the minute so going back to somewhere you’ve been, in my mind, still counts as going forward. Coming up next is somewhere new for both Andy and I – it looks like we’ll be meeting up in Dubai. Still though, I’m looking forward to the next time one of us gets to show the other around. In Manila, it was pretty fun to see somewhere new through the eyes of someone familiar and I just have to hope that Andy has felt the same way all these years. 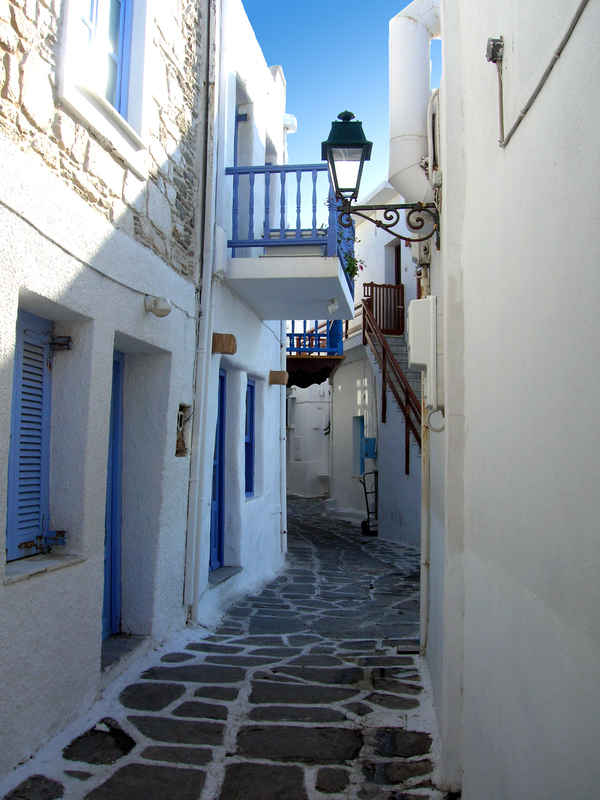 The lovely Nauossa, Greece circa 2010. 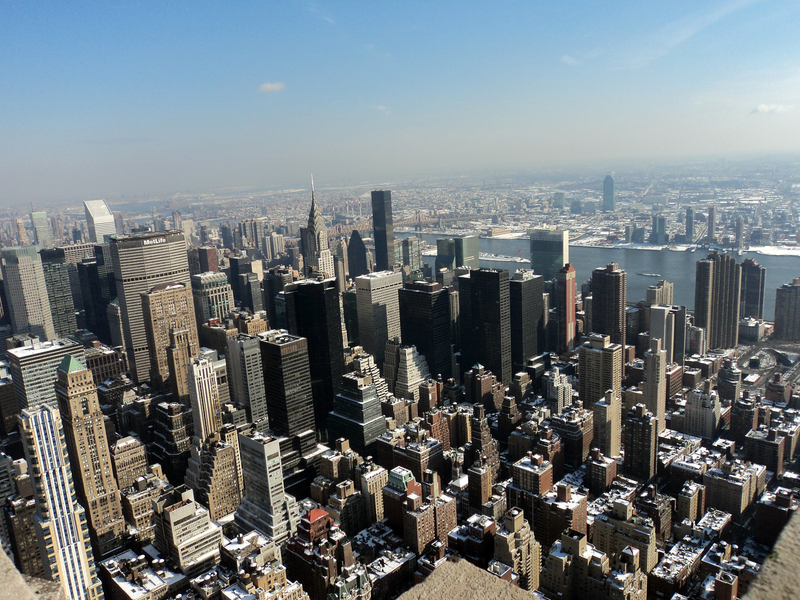 The always wonderful New York City circa 2011. 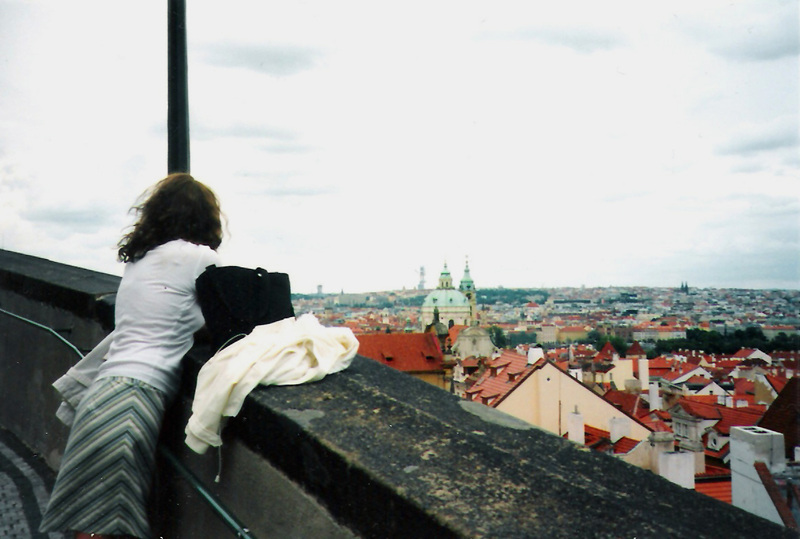 Overlooking beautiful Prague, Czech Republic circa 2004. I love this post. It’s so true. I also think places are different depending on when in life you are there, and who you are with. I traveled all over Europe in college. Going back to the same places now, married, with my husband, is a completely different experience. Different priorities and more money can make for a completely different experience. Not necessarily better, just different. Definitely! I remember being told once while I was in college that everyone has to go to Europe at least twice… once as a student for the parties and once later on for history and culture. Both are fun… just really different.